Today you may be given cause to delve into the deepest regions of your psyche, where instinct, perception and intuition all reside. The High Priestess — seen in this version as the goddess Persephone — is a dynamic, mystical force that relies on harnessing inner knowledge and wisdom. Persephone started her descent into the Underworld as a frightened and lonely girl, dragged into the darkness against her will. But here we see her transformed from the fearful child and into her rightful position as Queen. She stands between two pillars (one black and one white) as guardian of both worlds — with a pomegranate in one hand and bouquet of narcissus flowers in the other. Each of the these symbols reflect important stages in her journey, as well as the dual forces of nature that are implicit in this card. The High Priestess refers to getting in touch with your intuition. Listening to your inner voice. Heeding your psychic impressions. And tapping into the vast reservoir of wisdom that you may not have taken the time to nurture in recent months. 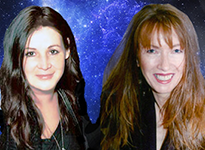 While you may be apprehensive about exploring those realms, the answers to your most pressing concerns are right there at your psychic fingertips, if you only you allow yourself to trust in them. Profound psychic impressions — in dreams or in synchronistic events that occur in your day-to-day life — are very common with this card. There’s a renewed connection between the inner and outer worlds that’s impossible to deny. There’s an awakening of psychic senses and an uncanny ability to tap into the unknown. There’s no cause for alarm here though: as with Persephone venturing into the Underworld, you’ll find that at the end of this journey, only riches abound. 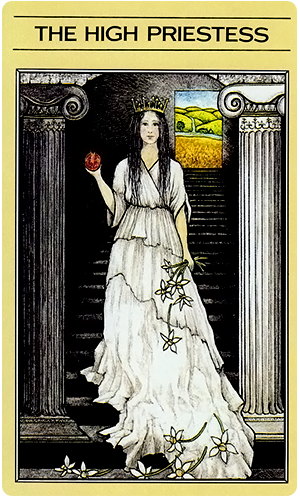 Today’s card — the High Priestess — comes from the Mythic Tarot by Juliet Sharman-Burke and Liz Greene, illustrated by Tricia Newell, distributed by U.S. Games. This deck can also be downloaded as an app for IPhone, IPad and Android devices through the Fool’s Dog website.